“Seasonal” and “gift” fit so well together for marketing campaigns. They strongly influence customer‘s buying behavior. Being a limited-edition gift with purchase, you can strongly motivates customers to make a purchase. 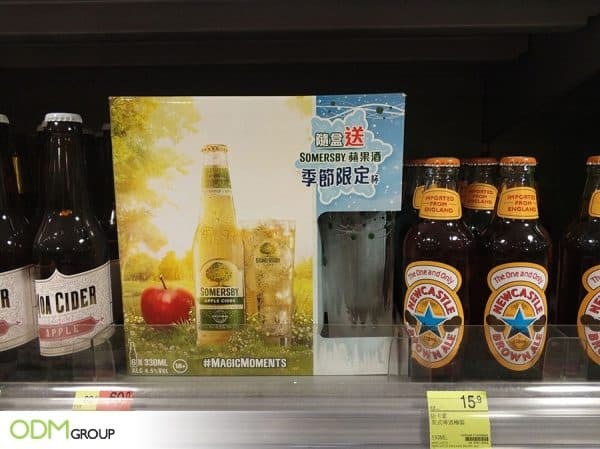 Now, let’s check out a seasonal gift with purchase: a branded glass offered by Somersby Cider in China. What we like about Somersby Cider’s seasonal gift with purchase ? Product series– Cider and glass is a package. When drinking the cider, customers will need a glass. Thus, Somersby Cider meets customers’ need and build relationship with them. Logo– Logo is important in building brand awareness. After the customer used the glass for a long time, they will remember the brand’s logo and name. ODM can help create or develop your brand’s logo. Check the blog here: Custom Logo Design – Sarobag case study. Limited quality product– Seasonal gift is different than the usual promotional products. They are offered for a specified period of time. Somersby Cider’s glass is limited offer in Winter. Thus, not everyone can get the same glass as gift with purchase on ordinary days. For winter seasonal product, here is an example. The below product is a great promotional stint for Christmas. Why we like the seasonal gift with purchase idea like Somersby Cider? Consumer motivation – Most of the people like to find out something special. Also, people like to get freebies. Seasonal gift with purchase provides a reason for customer to come back to the brand again and again. Brand engagement – A good gift should be useful and bring benefit to customers. It helps brand to engage with customers and eventually becomes part of customers’ daily life. For example, Somersby Cider’s glass is perfect for every day use. Brand reciprocity – Every customer wants reciprocity of value, meaning, they want to get the most of what they pay. The more money they spend on the brand, the more value they want to get from it. Therefore, a custom gift with purchase product can help create trust and commitment. Increase sales – You can apply seasonal gift with purchase idea with other promotions. For example, Somersby Cider, it offers 6 bottles of cider and a free glass. It helps to clear the store faster and increase sales. Check out more on-pack promotion for drinks industry. Here is a special offer from Thailand! Moccona, a popular coffee brand is offering an on pack promotion. Buy one package, and will get one set of beer and glasses. Jameson, an Irish whiskey, is using on-pack promotional strategy to fit promo perfectly. Sagatiba’s on-pack promotional idea is definitely one of its kind. It gives a reason for customers to drink together with friends using its shooters. Overall, a seasonal gift with purchase has attractive feature and grabs customers’ attention. I believe customers will be hyped to make a purchase to get a special free gift! At ODM, we help you to create a unique gift with purchase for your brand. Also, we design and manufacture products for on-pack promotion, promotional product packaging, promotional gift sets and other promotions. If you are interested, feel free to contact us anytime. Here are some good examples of promotional gift with purchase from notable brands. Nutella, a well known hazelnut spread brand, not only used gift with purchase strategy in marketing, but also incorporated POS display. Purchase above 88RMB of Dettol products, customers will get a promotional trolley for free! They can directly use the trolley to carry the Dettol product they bought. How thoughtful the brand is! Luxury brand, ARTE Madrid, offered free gift with purchase during their last campaign. Using high quality lustrous glass container, ARTE Madrid is presenting its brand identity – stylish and expensive.